This past week, I have made a concerted effort to draw and do some drumming. The drumming will keep for another blog date for now... 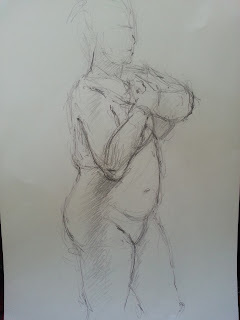 But... Last week I did some life drawing at Colin Merrin's Studio in Southsea. He has sessions on Thursday evenings. He has a fab studio, and I loan him my easels and drawing boards. 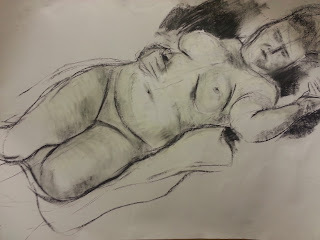 I hadn't done any proper life drawing (other than some quickies when I am teaching it to the computer gaming/animation students at uni) for some time, so I really enjoyed it. I had introduced Mimi the model to Colin - she also models for another artist friend of mine, the fabulous Chris Wood, and she does a fantastic job. Here's the drawings I completed of Mimi for that evening. Below are my initial sketches of Mimi. 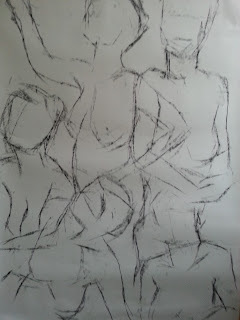 The above were done quite quickly with simple, and straight forward pencil on cartridge paper. 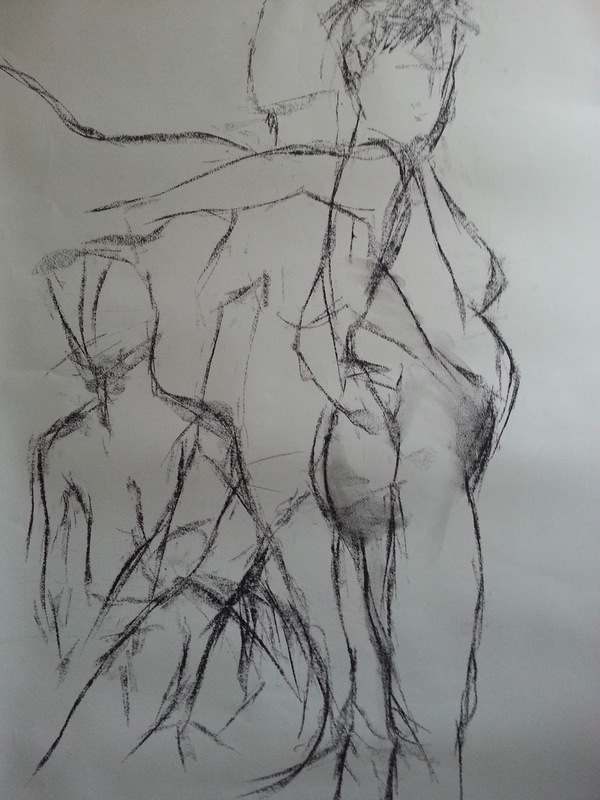 Then I changed position to draw the longer pose. 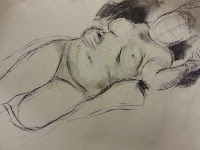 This time, I moved across the room, and used compressed charcoal and white chalk, along with a putty rubber. I also managed to get a ticket to an event at Pallant House Gallery in Chichester. They were doing an event that really intrigued me. 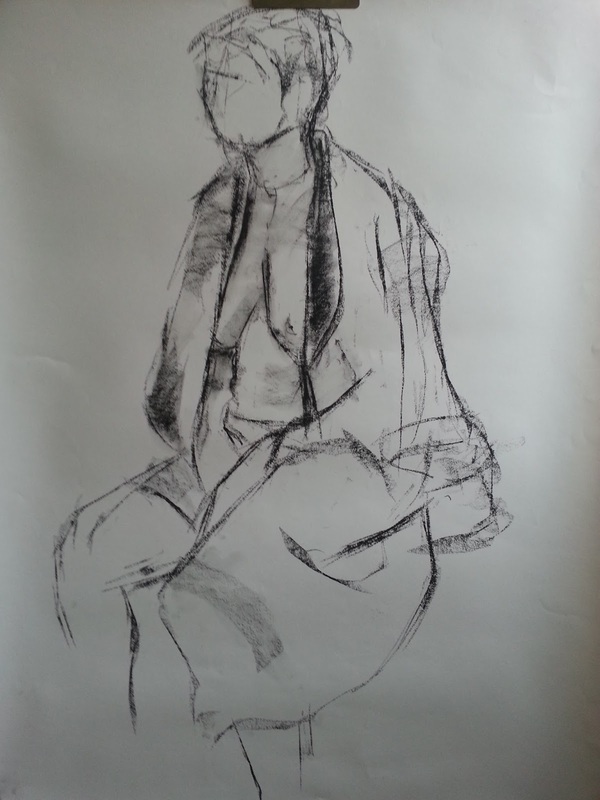 It was an afternoon life drawing session with a performance artist, Sue Maclaine. 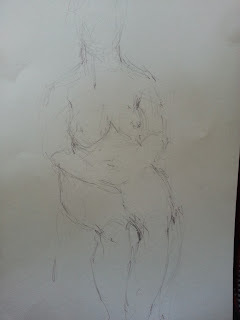 She does a fabulous performed study of\the artist model, muse, writer, mother, lover and drug addict Henrietta Moraes. She was of course the model and lover for one of my favourite painters, Maggi Hambling. As a student at Central Saint Martins in the early 1990's I used to gate crash all the Friday night art private views down in Cork Street, and I was lucky enough one Friday evening to gate crash one of Maggi's. I met George Melly, one of Maggi's close friends and saw all sorts of wonderful people along with meeting wonderful paintings (when you see one of Maggi's paintings and drawings in the flesh, it's like introducing new friends into your life). So, getting an opportunity to see how this interpretation of Henrietta would be portrayed was an opportunity not to be missed - I also think I owed myself a treat after all my marking at the end of an academic year. The performance was fabulous. 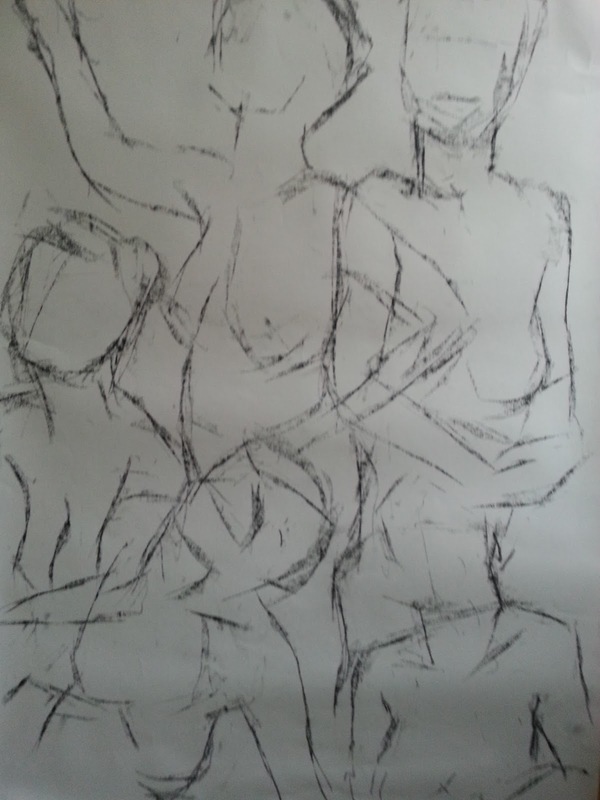 Sue really managed to capture the sense of a bohemian life in both language and the poses she held. 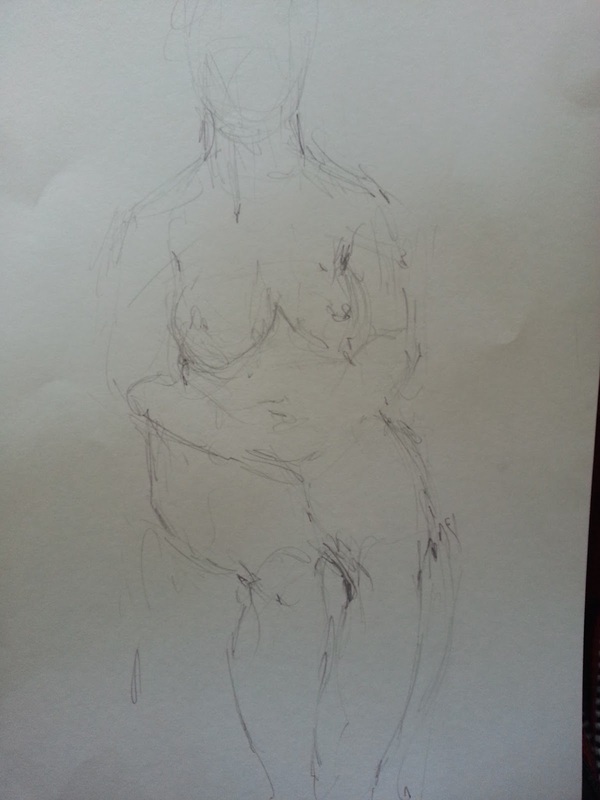 There were about 20 people in the audience in the Pallant House lecture/studio; all with their sketch books (I managed to grab an easel), drawing away, whilst Sue gave us an inkling as to what happened to Henrietta, and her life as muse, model and all round bon viveur. The first few sketches were all done on one sheet of paper. Sue, in becoming Henrietta, gave an outline and introduction as to the contents and nature of the performance - we did lots of short poses. 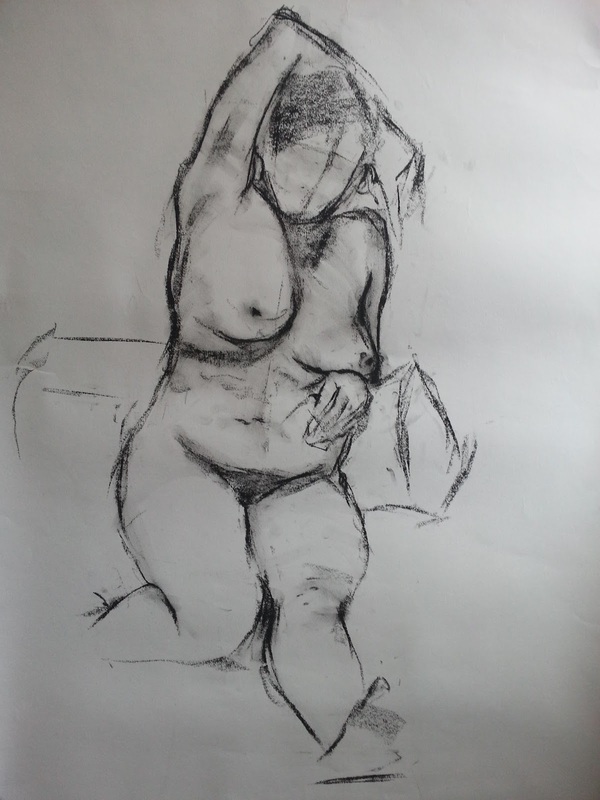 All the time, she was changing pose to imply conversation with Deakin or Bacon, and the poses flowed within the narrative of the piece as a whole. Eventually you almost forgot you were drawing, and were simply drawn in by the pictures painted in your mind by Sue and her very carefully observed poses that have been well documented of Henrietta. She was spot-on! 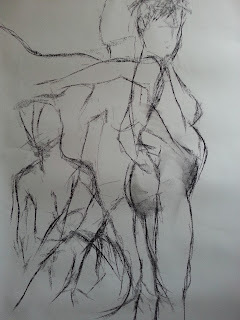 The next series of poses were a little longer and more complex. Sue Maclaine had totally become Henrietta for me. She (Henrietta) then sat, with her robe casually wrapped about her, and talked to us about her relationships, her drug and alcohol consumption and her awkward attempt at burglary. Well... this just makes me want to do loads more life drawing sessions. I will have these works with me on the 21st June at the Spice Island Arts Trail where I will be showing work in the Royal Naval Club in Old Portsmouth. Next time... more about drumming!! !